Wayne Johnson uses ingredients form the farmers market to make an entire meal that requires no cooking. 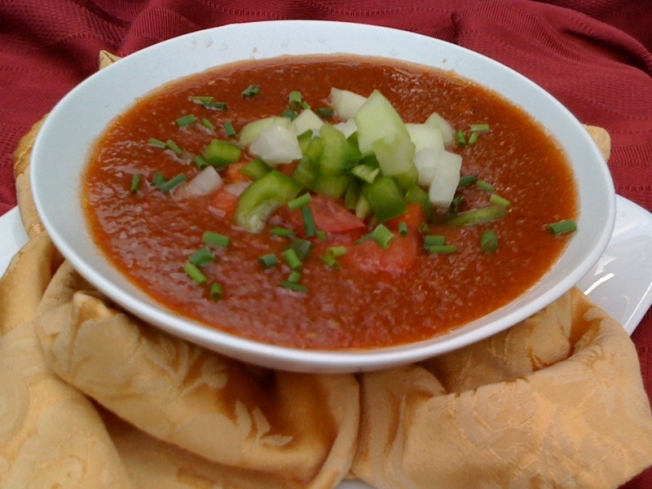 Fresh produce from the farmers market are a perfect base for gazpacho, a tasty summertime treat. Framers markets offer quite a bounty of fresh produce and freshly made goods like breads, cheeses, preserves and spreads. Combined, those ingredients can be a great foundation for an entire meal that requires no cooking. Why heat up the kitchen when you can make a fruit salsa for starters, a spicy gazpacho and a gourmet sandwich with artisan breads and cheeses for a main course, and a raspberry soup to top it all off? You can also add to that a nice white sangria made with apples, peaches, strawberries and even sliced seedless cucumbers. Take a stroll through the market, pick out what looks good and then add a few grocery items to complete the ingredient list. You’ll have a great meal and your kitchen will stay as cool as the cucumbers. Cut 1 tomato into large chunks. Place tomato in a blender with 1 cup of tomato juice. Add 1/2 each of the cucumber, onion and green pepper. Add 1 jalapeño pepper. Blend ingredients until smooth. Transfer to a large bowl. Add remaining tomato juice, olive oil, red wine vinegar, balsamic vinegar, Louisiana hot sauce, cumin, dill, chili powder, Worchestershire sauce, salt and pepper. Stir ingredients together, cover and refrigerate for 2 hours or longer. Meanwhile, chop the remainder of the cucumber, onion and green pepper and place in separate small bowls or serving dishes. Chop the remaining jalapeño pepper and place it in a small bowl or serving dish. Place chives, sour cream and croutons in serving dishes as well. Serve gazpacho in individual bowls and allow your guest to add any of the extras that they like. If you’d like a simpler version, add all the chopped ingredients except the sour cream and croutons into the gazpacho and serve with a dollop of sour cream and a few croutons sprinkled on top. Place raspberries, yogurt and mascarpone cheese in a blender and blend until smooth. If you aren’t a big fan of the seeds, you can strain the mixture through a fine mesh strainer. Cover and refrigerate until ready to serve. Meanwhile, chill individual small serving bowls. To serve, squeeze lemon juice into mixture and pour into serving bowls. Top with a few raspberries and garnish with fresh mint. Mix all ingredients except the lemon and club soda and refrigerate for 2 hours or longer. Chill the club soda as well. When ready to serve, Add the clube soda and the lemon slices to the mixture. Fill glasses with ice and add sangria, being sure to add a bit of fruit to each glass. Mix ingredients together and sprinkle a bit of sugar on top. Toss to combine. Serve with tortilla chips or pita chips. Be sure to get out there and take advantage of all the fresh fruit, produce and homemade goods available at your local farmers market. They’ll be gone before you know it.